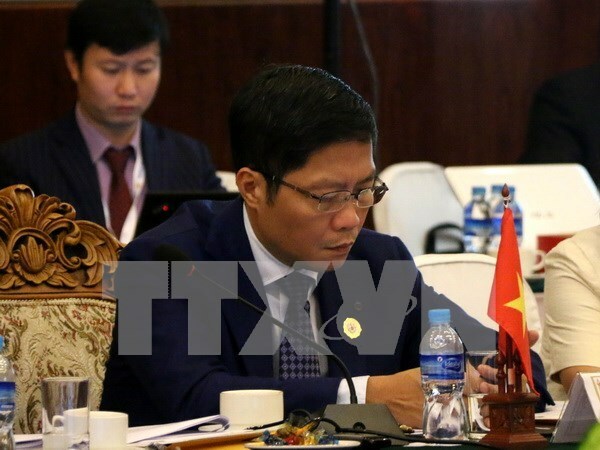 Vientiane (VNA) – Minister of Industry and Trade Tran Tuan Anh has proposed that Vietnam and the Philippines consider the extension of the rice trade deal between the two countries, which will expire at the end of this year, to another period from 2017 to 2020. He made the proposal during a meeting with his Philippine counterpart Ramon Lopez in Vientiane, Laos on August 5 on the sidelines of the 48th ASEAN Economic Ministers’ Meeting and related meetings. Minister Anh suggested that the Philippines organise the second meeting of the Vietnam-Philippines Joint Sub-Committee on Trade at a convenient time to foster cooperation and timely tackle emerging problems in bilateral trade ties, as well as discuss specific measures to boost two-way trade in the future. Ramon Lopez lauded Vietnam’s proposal to extent the bilateral rice trade deal, affirming that he will discuss the matter with the relevant ministries and agencies of his country. He agreed to organise the second meeting of the Vietnam-Philippines Joint Sub-Committee on Trade in the third quarter of this year, and invited his Vietnamese counterpart to co-chair the event in the Philippines. Both sides expressed pleasure at the growing bilateral trade partnership over the past few years, with two-way trade reaching nearly 3 billion USD last year and 1.52 billion USD in the first half of 2016, a rise of 15.3 percent year on year. So far this year, Vietnam has exported 1.08 billion USD worth of goods to the Philippines, up 17.5 percent, while importing 443 million USD worth of goods, an increase of 10.3 percent.